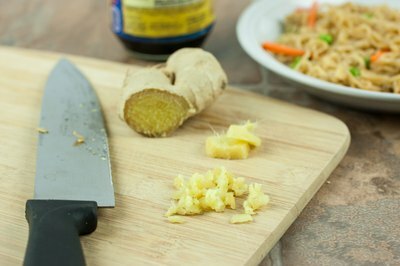 If you make delicious stir-fried Chinese, Thai or Indian food -- but at widely spaced intervals -- you already know the challenge of keeping fresh ginger root on hand in peak condition. You may only need 2 tablespoons of minced ginger root per dish. And while this dazzling aromatic has become far more widely available in recent decades, it’s still not something you can find at every convenience store -- and it gets squishy in the fridge or on the counter. With proper storage techniques, though, you can have quality ginger root at hand year-round. One useful plan of battle is to purchase a ginger root roughly the size of three fingers when you are just about to cook Chinese, Indian or Thai food. You can mince several tablespoons of the freshly purchased root for immediate use, and store the remainder in one of four ways. 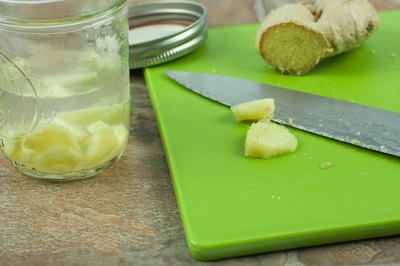 You have two choices as to how to store ginger root in the refrigerator. It will keep for about eight weeks unpeeled, wrapped in a zip-top bag in the crisper. For longer storage up to a year, peel the root with a peeler or your thumbnail, and cut it crosswise into discs about ¼ inch thick. Arrange the discs in a small, clean glass jar -- a small, repurposed jelly jar is perfect. Traditionally, Chinese chefs pour cooking sherry over the ginger root, tap the jar to remove air bubbles, and screw on the lid before refrigerating. More recently, chefs are moving toward vodka as a preservation liquid that maintains both flavor and texture. Sake, rice wine and other alcohols of 18 percent or more can also be pressed into service. 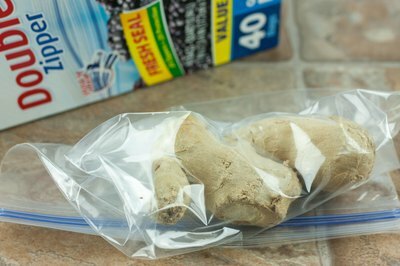 You can similarly keep ginger root for a year sealed in a freezer bag in the freezer, with all the air squeezed out, either peeled or unpeeled at your discretion. 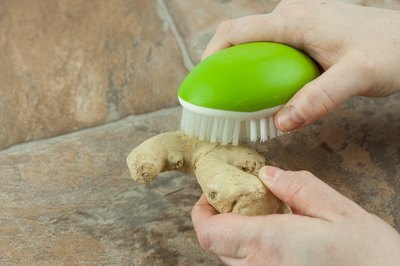 Unwrap the ginger root and scrape it against a microplaner -- also called a citrus zester -- when you are ready to use it. You can even plant fresh edible ginger, unpeeled, in a pot of soil or a garden bed. The root is not fussy and produces an attractive foliage, and at harvest time you can pull up additional roots and scrub them clean with a vegetable brush. 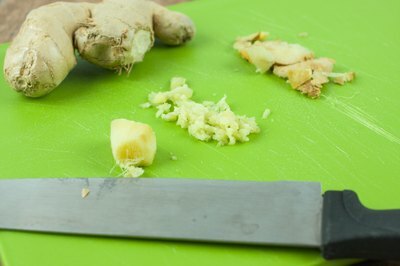 Fine Cooking: What's the Best Way to Store Ginger?